We have undertaken a thorough review of our books, records, and existing loan files for all Group 2 loans and believe we have completed assignments into the appropriate entity for both portfolios where appropriate, available, and where such a need for an assignment is known. However, in our mortgage servicing activities, we continue to be faced with legal and technical challenges, such as borrower bankruptcies and enjoined proceedings, requiring we recreate a chain of title based on factors that cannot be identified in advance without obtaining an updated title report on every loan serviced. It is cost prohibitive to obtain an updated loan level title report for each loan we are servicing, which, again, would be the only way to ensure a clean chain of title through all prior transfers. This also begs the question. If you don’t have a clean chain of title in your servicing records, and won’t invest in a title report to determine who owns the loans you service, who are you sending the money to? Things are going to get real interesting now! On February 15th, 2018, the following Order was handed down in the Circuit Court for Palm Beach County, Florida. Here is a little background on this case. 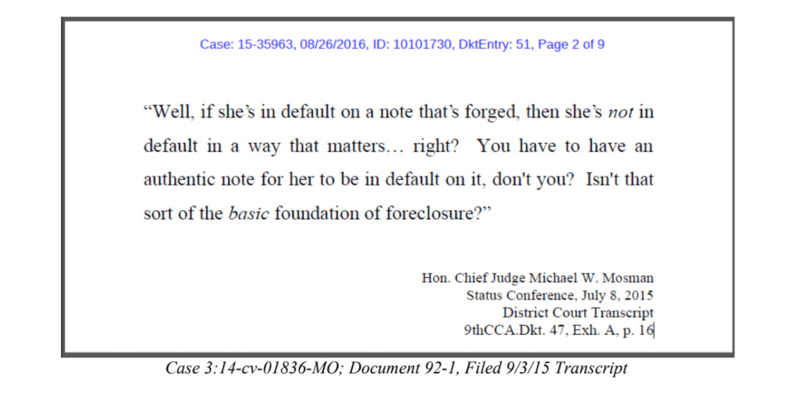 The Plaintiff is current on his loan that was originated in 2005 by Washington Mutual Bank, F.A., and has never been declared in “default.” However, having become aware that serious defects may exist over the title to his property, Plaintiff sought answers to the most basic questions. Who owns my loan? And, who is receiving my payments? I believe the rationale behind this Order stems from the fact this is a non-default situation. Chase’s attorneys are struggling to defend this action because they cannot rely upon the worn-out “deadbeat trying to score a free house” argument. I’ve been saying for years now that the banks may have dominated the narrative in the foreclosure realm thus far, but they are going to be in big trouble if/when the masses of borrowers, who are “current” on their mortgages, begin their own crusade for answers as to who owns their loan, AND WHERE ARE THEIR PAYMENTS GOING? Until these questions are properly answered through verified evidence, no one’s title and money is safe. Things are going to get very interesting now! This is the Oregon Uniform Trial Court Rule regarding the surrender of negotiable instruments before the entry of a judgment. Oregon is typically a non-judicial foreclosure state. However, the bank servicers have been increasingly choosing to go the judicial route. My sources are telling me that the clerks in the Oregon courts who have been asked about this rule have either said, “we aren’t doing that,” or they provide an expression like that of a “deer in the headlights.” Apparently, the Oregon Court Rules don’t apply to the banks if deemed inconvenient. (1) In all cases when a judgment is to be based on a negotiable instrument, as defined in ORS 73.0104, the party obtaining judgment must tender the original instrument to the court before the entry of judgment, unless the court has found that such party is entitled to enforce the instrument under ORS 73.0309, and the court must enter a notation of the judgment on the face of the instrument. (2) The trial court administrator shall return the original instrument only after filing a certified copy of the instrument. Investigator Bill Paatalo: Wells Fargo Admits To Executing WaMu Note Endorsement in 2013, And the Arkansas Bankruptcy Court Allows WaMu to Get Away With It! Editor’s note: Great analysis by investigator Bill Paatalo at BPinvestigativeagency.com. Arkansas courts are known to be some of the most corrupt bankruptcy and foreclosure courts in the country and the Arkansas Judiciary refuses to follow its own laws while catering to the interests of Foreclosure Mill Wilson and Associates. US bankruptcy trustee Joyce Babin is known for her bank-friendly decisions and has now legitimized fraud-on-the-court as an acceptable practice. This decision out of an Arkansas Bankruptcy Court has to be one of the most bizarre rulings I have ever read to-date. (See: Schiefer v Wells Fargo – Arkansas). Though the Court appears to get the facts utterly wrong in this case, there is one valuable nugget (FACT) that now exists – Wells Fargo admits to executing an endorsement upon a note by a WaMu Officer in 2013! The endorsements of WaMu officers appearing on notes long after the FDIC Receivership is what I have been attesting to for years now based upon a conglomeration of evidence. But now, we have an actual admission! 3. In 2007, Washington Mutual assigned the mortgage and note to Wells Fargo. (Wells Fargo Ex. D.) [COMMENT: THE EVIDENCE SHOWED NO ASSIGNMENT UPON THE NOTE PRIOR TO THE FDIC RECEIVERSHIP.] In addition, according to Bateman, Wells Fargo obtained physical possession of the note and mortgage at that time. With the assignment, Wells Fargo became either the owner of the note and mortgage or, if Fannie Mae was the owner, then Wells Fargo became the servicer of the note. Regardless, at the time of the assignment, the note was not indorsed either in blank or to Wells Fargo. Under Arkansas law, the assignment would not have been concluded (or negotiated) until the note was indorsed. Ark. Code Ann. § 43-203(c) (“if an instrument is transferred for value and the transferee does not become a holder because of lack of indorsement by the transferor . . . negotiation of the instrument does not occur until the indorsement is made.”). 5. According to Wells Fargo’s response to the debtors’ requests for admissions, in February 2013 Wells Fargo added the second indorsement (the indorsement in blank) pursuant to a limited power of attorney from JP Morgan. [COMMENT: SECOND ENDORSEMENT? WHERE IS THE FIRST ENDORSEMENT?] The indorsement in blank was signed by Leta Hutchinson as Assistant Vice President of Washington Mutual Bank, FA. According to Hutchinson’s deposition (Dbs.’ Ex. G), Hutchinson was employed by Washington Mutual in February 2013. [COMMENT: EMPLOYED BY WASHINGTON MUTUAL IN 2013?!] Hutchinson also stated that she previously was an Assistant Vice President of Washington Mutual but ceased that position in May 2006. [COMMENT: EVEN WHEN HER ENDORSEMENT WAS PLACED UPON THE NOTE IN 2013, AND EVEN IF SHE WORKED FOR WASHINGTON MUTUAL LONG AFTER IT DIED, SHE WASN’T AN OFFICER! ]When asked in the deposition what her job responsibilities were at Washington Mutual, she stated that she was the department manager for the documentation department but did not state when she held that position or what her job title was in February 2013. Based on the above time line and the evidence presented at trial, the Court makes the following findings of fact that are relevant to the Court’s decision. First, at the time the debtors filed their bankruptcy petition, Wells Fargo was either the owner of the note and mortgage (based solely on recorded state court documents) or was the servicer of the note (based on testimony and interrogatories that identify Fannie Mae as the owner). Thursdays LIVE! Click in to the The West Coast Foreclosure Show with Charles Marshall. Get a Consult! https://www.vcita.com/v/lendinglies to schedule, leave message or make payments. A Witness to What? Fake documents, affidavits and depositions rule at JPMorgan Chase. Investigator Bill Paatalo joins California attorney Charles Marshall on the West Coast Foreclosure Show, and continues his ongoing analysis of the Washington Mutual/Chase ‘merger’ that appears to be little more than an elaborate ruse to keep homeowners and the courts from recognizing that the emperor has no clothes. In April 2017, California Attorney Ronald Freshman of Newport Beach, California deposed Chase witness Rosemary Martin. Ms. Martin inundated the court with a ream of mortgage documents and statements that had the appearance of validity, but when placed under oath had no information relevant to the Plaintiff’s loan. Martin had been coached poorly and the plaintiff’s attorney, Ronald Freshman, annihilated her testimony. Eventually the witness surrendered that they had no knowledge of anything of importance. The Chase litigation strategy is to play coy and hope the judge won’t catch on. The Martin deposition reveals that the codes and names of the ‘investors’ do exist in Chase’s ‘LISA system’ database, despite JPMorgan Chase’s attempts to claim ignorance. And that folks, that is how a poorly coached bank ‘witness’ is permitted to steal your home. The Martin deposition is 200 pages documenting a witness’s attempts to come off credible while failing spectacularly. Meanwhile, the bank’s attorney objects constantly to prevent the admission that the witness can read a computer screen, but knows nothing of value regarding the loan. Livinglies recently received a copy of an Errata motion filed by JPMorgan Chase. The motion was a request to remove sections of former JPMorgan Chase in-house attorney, Michael McCormick’s deposition. Not because there was en error or ‘Scribner’s error, but because Chase attempted to use an Errata motion to censor information that was potentially harmful to them- not because it contained an error. An Errata (“error”) motion is typically used to correct minor errors or omissions in a pleading such as the late submission of a missing exhibit or page from a declaration or motion, or a replacement page that is necessary by a glitch in photocopying. By filing a Errata motion, Chase attempted to ‘get around’ opposing counsel’s ability to challenge the motion. Fortunately the judge refused to grant the motion. Chase use of an Errata motion was an underhanded strategy to remove potentially harmful information contained in its former attorney’s deposition. It isn’t just low-level employees that are coached-up by Chase prior to a deposition, but also prior in-house attorneys too. Former JPMorgan Chase in-house counsel Michael McCormick provided a deposition that confirmed that the “AO1” investor-designation refers only to Washington Mutual Bank (WaMu) ‘loans’, and yet, JPMorgan Chase has adamantly denied that this code refers exclusively to WaMu loans. Furthermore, JPMorgan Chase is in violation of the National Mortgage Settlement consent judgment that required Chase to stop it’s illegal practices including forging endorsements, manufacturing documents, filing fabricated documents in county recorders offices and providing false testimony. Former FDIC team-member Eric Mains has encouraged homeowner who have been harmed by an unscrupulous loan servicer to file FOIAs with their state Attorney Generals offices in order to determine compliance with the consent judgments, and if that fails, to contact the ACLU. As an example, attached as Exhibit 6 is a transcript of JPMorgan Chase’s witness taken from a deposition in “comparable case #2.” (Note: Per Bill Paatalo, this case involves two WMB loans with “Investor Codes ‘AO1’” that JPMC denied belonged to WMAAC.) The witness, Michael McCormick, a former in-house attorney for JPMC, testified that he had never seen the “original” note (P.114, L.13-16), that he had seen different images of the same note (P.115, L.20-24), that he had seen a copy of the 2005 WMB note without the endorsement in 2011 (P.117, L. 13-25 & P.118, L. 2-5), and that he had no knowledge of who placed the endorsement upon the note and when (P.119, L. 17-19, P.121, L. 8-12, & P.123, L. 18-24). However, when asked if there was a way to find out when the notes were endorsed within the servicing system(s), McCormick responded, “perhaps.” And when asked if he knew where to look to find that information, McCormick responded, “sure.” (P.123, L. 18-25 & P.124, L. 2-6). In hundreds of cases I have investigated involving WMB (WaMu) endorsed notes proffered by JPMC, or an assignee from JPMC, no witness has attested to, or has been willing to attest to anything specific regarding the endorsements and/or allonges; who endorsed the notes and when? Answers are much like that of McCormick; evasive, with no knowledge or recollection. With McCormick, he testified that he knew of no one at JPMC who could answer the questions as to the endorsements. Yet, he personally knew where to find these answers but deliberately chose to play coy. JPMorgan Chase’s strategy is a plausible-deniability defense where there is no one (not even counsel) that can confirm nor deny the securitization process, the purchases, sales, transfers, assumptions- or anything else. Therefore, Chase’s use of compartmentalization keeps everyone ignorant of the real truth. In fact, by now, the only ‘evidence’ of ownership Chase can provide on acquisition of WaMu loans is the account number listed on a computer screen. Attorney Stephen Wright in Connecticut did an exemplary job of digging deep and providing a plethora of evidence damning to Chase. This session of the Charles Marshall’s West Coast Foreclosure Show features former FDIC team leader Eric Mains who will discuss FOIA strategies in regards to the LPS/BlackKnight consent judgment. Eric Mains originally introduced the FOIA BlackKnight LPS concept during the August 3, 2017 broadcast here. Mains urges listeners to immediately contact their state AG offices to obtain information about the LPS/Black Knight consent judgment in your state, and to demand answers why LPS is not in compliance with the judgement. The information you discover may allow you to file suit on a prior foreclosure, or provide an opportunity to obtain information that will help you in current litigation. See articles here and here. Investigator Bill Paatalo will discuss Nardolillo v. JPMorgan Chase, a northern California case scheduled for trial in April 2018. JPMorgan Chase’s Motion to Dismiss was recently denied based on its failure to demonstrate ownership of the note and Deed of Trust. Chase relies exclusively on a Purchase and Assumption Agreement (PAA) as proof of ownership, but the court has stated that the PAA does not by itself, “establish as an incontrovertible fact that Chase is entitled to enforce the note.” Nardolillo alleges that the Note and DOT were already securitized prior to the FDIC receivership of Washington Mutual Bank (WaMu), and therefore WaMu could not convey what it did not own. High praise to Attorney Ron Freshman in San Diego, CA and his paralegal Kimberly Cromwell who recently obtained this remarkable “Stipulation of Fact” from JPMorgan Chase Bank’s counsel. (See #8 – Chase Stipulated Fact – AO1 – WMAAC). Last November, I wrote the following article seeking the identity of private investor “AO1.” (See: http://bpinvestigativeagency.com/who-is-private-investor-ao1-jpmorgan-chase-refuses-to-reveal-the-identity-of-this-investor/). Folks, I have opined against Chase for years now that this investor code does not signify “banked owned” loans on the “books of Washington Mutual Bank,” but rather a securitization subsidiary of Washington Mutual, Inc. I’ve been attacked by Chase who has argued vehemently that my opinion is simply dead wrong, and has sought to have my testimony stricken. Well it appears as though I’ve now been vindicated! This stipulated fact runs contrary to Chase’s long standing position, in thousands of foreclosures across the United States, that it acquired “AO1″ loans because they were “on the books” of “Washington Mutual Bank” per the Purchase & Assumption Agreement (PAA) with the FDIC. This has been a lie, as these “AO1″ loans could not have been a part of the PAA due to the sale and securitization of said loans by WMB through its “off-balance sheet activities.” More so, Chase’s use of the FIRREA argument against homeowners for loans not on WMB’s books may have suffered a tremendous blow here. Q. And do you know whether or not at the time of the acquisition of the assets that are identified in the purchase and assumption agreement with the FDIC to Chase dated September 2008, did it include a list of the loans that Chase was acquiring? A. I mean, I didn’t see an actual list, but there’s — it’s in the system. It’s in the MSP servicing — that’s a system the bank uses to service the accounts. Q. Is it your testimony that the Freeman loans were owned by Washington Mutual F.A. at the time the bank failed? Q. Is it your testimony that Washington Mutual Bank or some subsidiary of the bank was not servicing those loan at the time? MR. HERMAN: Can you read that back, please. MR. HERMAN: At what time? MR. WRIGHT: Prior to September 25, 2008, between the time they were made and September 25, 2008. A. The servicer was Washington Mutual F.A. Q. Okay. Was there an investor? A. It was bank-owned. It’s always been bank-owned. Q. It’s always been bank-owned? Q. And you know that because? A. I reviewed Chase’s books and records. A. Well, they’re through the investor screens and also the ID codes,investor ID codes. Q. Okay. And the ID codes are letters, aren’t they? A. They consist of letters and numerals. Q. Okay. And what letters would indicate an investor? A. There’s three digits or three characters. Q. Two letters and a number? A. No, it could be a mixture of. Q. So what three characters — well, let’s put it another way. What characters would indicate a Chase-owned asset — a WaMu-owned asset? A. For these two loans? Q. And that AO1 stands for what? A. That’s just the three digit code, which is bank-owned. On September 22, 2016, the SEC issued the following “Cease & Desist” order against “Wilmington Savings Fund Society, FSB” who was the successor to “Christiana Bank & Trust Company.” (See: Wilmington Savings Fund Society – SEC Cease and Desist 2016 ). The following excerpts spell out quite clearly that this entity has been operating as a Trustee / “Transfer Agent” on behalf of unverifiable investors. WSFS’ failure to maintain “books and records,” as well as its filing of records that were “inaccurate and/or incomplete,” means it is very likely that this Trustee represented no one. The Securities and Exchange Commission (“Commission”) deems it appropriate that cease-and-desist proceedings be, and hereby are, instituted pursuant to Section 21C of the Securities Exchange Act of 1934 (“Exchange Act”), against Wilmington Savings Fund Society, FSB (“WSFS” or “Respondent”). 1. These proceedings arise from WSFS’ fundamental failure to comply with the rules and regulations that govern the conduct of transfer agents. Transfer agents are gatekeepers who provide critical services to issuers and their shareholders, including maintaining accurate shareholder records, timely processing of transfers, and responding to shareholder inquiries. To that end, issuers of securities, including corporations with securities registered under Section 12 of the Exchange Act, engage transfer agents to perform various recordkeeping functions. 2. Pursuant to Section 17A of the Exchange Act, the Commission promulgated rules governing services provided by registered transfer agents (the “Transfer Agent Rules”). As a registered transfer agent, WSFS was required to, among other things: (1) keep its registration current and accurate and to file annual reports regarding its transfer agent services; (2) make and maintain certain books and records for each issuer to which it provided transfer agent services; and (3) have written policies and procedures with respect to certain of its transfer agent services. 3. WSFS commenced acting as a transfer agent in 2010. From that time through 2013, however, WSFS failed to keep its registration current and accurate and failed to file an accurate annual report of its services. In addition, although WSFS maintained some records for issuers to which it provided transfer agent services, it did not maintain all of the records or create all of the reports required by the Transfer Agent Rules. Further, those records WSFS did maintain were inaccurate and/or incomplete. Finally, during this period, WSFS did not have any written policies or procedures to ensure compliance with the Transfer Agent Rules and WSFS employees were unaware of the Rules and received no training regarding the Transfer Agent Rules until 2013. 7. On December 3, 2010, WSFS acquired Christiana Bank & Trust Company (“CB&T”). CB&T ceased to exist and WSFS began performing the services formerly performed by CB&T, including transfer agent services, under the name Christiana Trust. WSFS provided transfer agent services, as defined by Section (3)(a)(25) of the Exchange Act, to a number of clients, including to at least one issuer with a security that was registered under Section 12 of the Exchange Act. 9. Section 17A(c) of the Exchange Act requires transfer agents to register with the Commission or, if the transfer agent is a bank, with a bank regulatory agency, before providing transfer agent services. Pursuant to Section 17A(c)(2), to register, a bank transfer agent files a registration form (Form TA-1), which provides basic information about the transfer agent’s business and activities. The Form TA-1 must be kept current and updated on an as-needed basis. If any of the information on the Form TA-1 becomes inaccurate, misleading or incomplete, Rule 17Ac2-1(c) requires the transfer agent to file an amendment to the form within 60 days of the occurrence. Rule 17Ac2-2(a) requires each registered transfer agent to also file an annual report with the Commission on Form TA-2, describing its transfer agent activities. These forms provide important information about the organization and activities of registered transfer agents, which allows the Commission to more effectively and efficiently monitor the activities of registered transfer agents and to evaluate compliance with the Transfer Agent Rules. 10. On December 3, 2010, WSFS acquired CB&T and immediately began performing the transfer agent services that had previously been performed by CB&T. However, although it was required to amend its Form TA-1 within 60 days of any change that would render the form “inaccurate, misleading, or incomplete,” WSFS did not file a Form TA-1 until June 22, 2011, six months later. Moreover, when WSFS filed its untimely Form TA-1, it inaccurately listed the name of the entity performing transfer agent services as “Wilmington Savings Fund Society, FSB,” rather than “Wilmington Savings Fund Society, FSB D/B/A Christiana Trust.” This is inaccurate because WSFS markets its transfer agent services under the name Christiana Trust. 11. In addition, WSFS did not file an annual Form TA-2 for the year ending December 31, 2010, even though it had operated as a transfer agent since acquiring CB&T earlier that month. 12. Further, when WSFS finally filed its first annual Form TA-2 on April 16, 2012, for the year ending December 31, 2011, WSFS failed to identify the correct number of individual securityholder accounts for which it maintained master securityholder files. WSFS was unable to provide the correct number on its Form TA-2 because it could not identify all of the issuers to which it provided transfer agent services. WSFS Failed to Maintain Accurate Books and Records in Violation of Sections 17(a) and 17A(d)(1) and Rules 17Ad-10 and 17Ad-11. 13. Pursuant to Rule 17Ad-10(e), a recordkeeping transfer agent must keep an accurate control book, which is a record or other document that shows the total number of shares (in the case of equity securities) or the principal dollar amount (in the case of debt securities) authorized and issued by the issuer. 14. In addition, Rule 17Ad-10(a) requires a recordkeeping transfer agent to accurately post transactions to the master securityholder file with details, such as the certificate number, number of shares or principal dollar amount, the securityholder’s registration, the address of the registered securityholder, and the issue and cancellation dates for the security (“Certificate Detail”), about the securities issued, purchased, transferred or redeemed. When there is a discrepancy between the Certificate Detail for a security transferred or redeemed and the Certificate Detail posted to the master securityholder file, Rule 17Ad-10(a)(1) requires that the details of that discrepancy must be maintained in a subsidiary file. The transfer agent must diligently and continuously seek to resolve those differences and then promptly update the master securityholder file. 15. A transfer agent’s failure to perform its duties promptly, accurately, and safely can compromise the accuracy of an issuer’s securityholder records, disrupt the channels of communication between issuers and securityholders, disenfranchise investors, and expose investors, securities intermediaries, and the securities markets as a whole to significant financial loss. 16. WSFS maintained master securityholder files for several issuers to which it provided transfer agent services; however, those files contained multiple inaccuracies. For example, for certain issues, WSFS failed to maintain accurate records of the outstanding balances and registered incorrect securityholder names in the master securityholder files. 17. Further, WSFS did not maintain subsidiary files or a control book for any issuers to which it provided transfer agent services and, therefore, WSFS could not determine whether, for any issuers, there were differences between the total number of shares or total principal dollar amount of securities in the master securityholder file for a particular issue and the number of shares or principal dollar amount in the control book for that issue (one type of a “Record Difference”). WSFS was required to report Record Differences that existed for more than 30 days (“Aged Record Differences”) and exceeded certain aggregate dollar thresholds that are established by Rule 17Ad-11 of the Transfer Agent Rules. WSFS was unable to determine whether Aged Record Differences existed and, therefore, was unable to determine whether it was required to report any Aged Record Differences. Indeed, WSFS’ account administrators did not even know that WSFS was required to maintain subsidiary files or a control book. If the Trustees / Transfer Agents have no verifiable records of who owns the underlying certificates, it becomes crystal clear that the servicers and trustees represent no one.